Home Tags Posts tagged with "new year 2016"
Hong Kong police have clashed with protesters in Mong Kok district after clearing of illegal food stalls set up for Lunar New Year celebrations. At least 23 people were arrested. Violence erupted overnight as food and hygiene inspectors tried to remove vendors from the junction of Portland Street and Shan Tung Street. Angry protesters threw bricks and other missiles at police. Police used batons and pepper spray and fired two warning shots into the air. At least 44 people, including police and journalists, were injured. 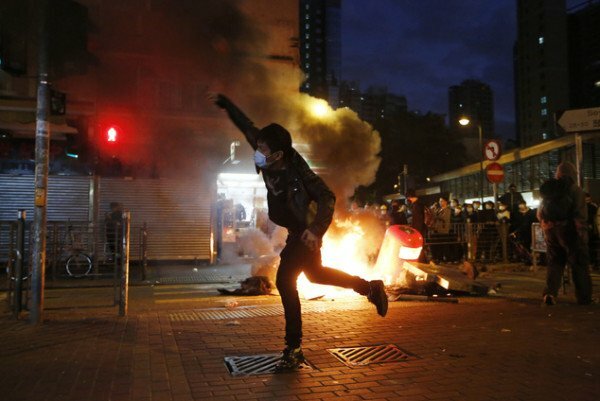 Hong Kong’s Chief Executive CY Leung has condemned the unrest, saying Hong Kong “can never tolerate that and the police will spare no effort to arrest the rioters”. It is the largest unrest in Hong Kong since the massive pro-democracy street protests in 2014. Street stalls are common in the Mong Kok area year-round, but particularly during the New Year holiday, where they are popular with locals for selling traditional New Year snacks. Ahead of the clearance operation, hundreds of people had gathered in the area to defend the hawkers. Police said the vendors and activists were told to leave but ignored the warnings. Clashes then broke out in the early hours, and carried on past dawn.. Among the protesters were reportedly some “localist” – anti-Beijing – groups. One of them was arrested, CY Leung said. Acting District Commander Yau Siu-kei confirmed reports that an officer had fired two warning shots into the air. He said the officer had to act protect colleagues, the South China Morning Post said. The unrest was widely referenced on social media, where it was dubbed #fishballrevolution after one of the food delicacies sold by the hawkers. 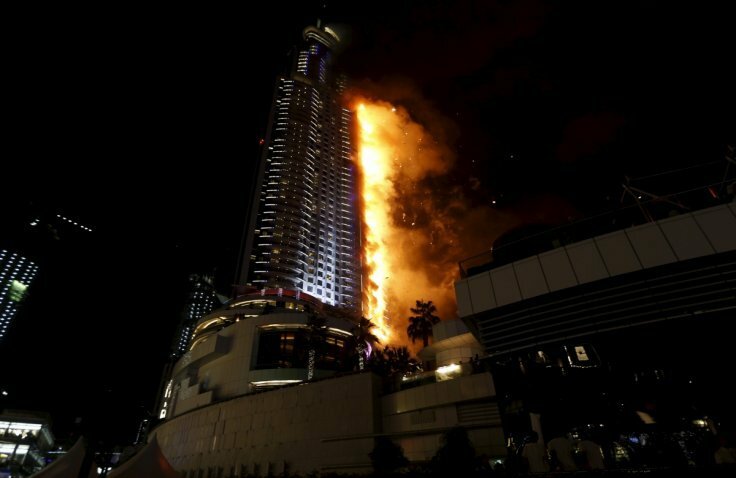 Dubai authorities are trying to find out what caused a spectacular fire to engulf a 63-storey luxury hotel in the city center on New Year’s Eve. Firefighters managed to subdue the fire, but part of the Address Downtown Hotel is still smoldering. A significant fire is still visible on the 20th floor, where the blaze apparently started. The tower was evacuated and 16 people were hurt. But a fireworks show went ahead at the Burj Khalifa tower nearby. The Burj Khalifa is the world’s tallest building and an iconic symbol of the United Arab Emirates (UAE). Streets around the Address Downtown Hotel have been cordoned off, but boulevards around the Burj Khalifa are open. The fire broke out at about 21:30 local time on December 31 and appeared to engulf much of the Address Downtown, a five-star hotel and apartment complex, within 10 minutes. Four teams of firefighters battled the blaze for hours, officials said. The Dubai government tweeted that 14 people had suffered minor injuries, one moderate injuries and there was one “heart attack case” due to “overcrowding and smoke”. The fireworks display went ahead as smoke continued to billow from the hotel. Alternative accommodation would be offered to evacuated guests, the Dubai government said. New Year celebrations have begun across the world, with revelers in Australia and New Zealand among the first to welcome 2016. Crowds counted down the last seconds of 2015 at Auckland’s Sky Tower in New Zealand with a laser show and fireworks display. Up to 25,000 people had been expected to turn up for the festivities. In Australia, fireworks lit up Sydney harbor at midnight. A million were expected to turn up. 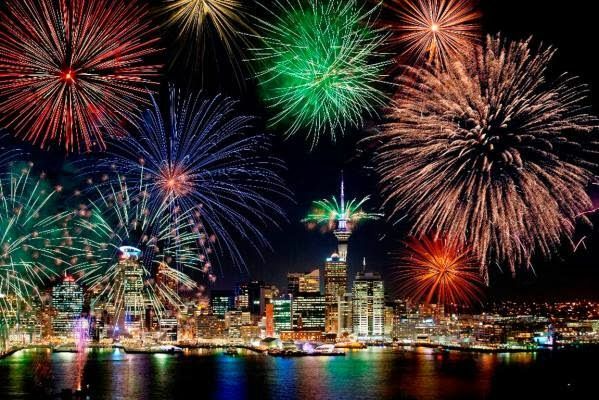 New Zealand welcomed in 2016 an hour after Samoa and Kiribati, the first countries to ring in the New Year. As the New Year sweeps across Asia, major cities like Hong Kong, Singapore and Beijing will kick off their own celebrations. In Egypt, festivities will be staged in front of the pyramids near Cairo, as the government works to revive its tourist industry. Meanwhile, in Dubai, an extravagant display will illuminate the Burj Khalifa, the world’s tallest building, with 400,000 LED lights and 1.6 tons of fireworks set to be used. In Europe, approximately one million people will countdown at the Brandenburg Gate in Germany’s capital, Berlin. Despite security fears across the continent, many major public events are going ahead, though with heightened security restrictions. In Madrid, only 25,000 people will be allowed into the Puerta del Sol Square. More than 100,000 people are expected to watch the Mayor of London’s fireworks show, a ticketed event. Over in Sierra Leone, the declared end of Ebola will mark a return to festivities, after Freetown, the capital, was left deserted a year ago due to the disease’s outbreak. As 2016 finally reaches the Americas, up to a million people are expected to converge on Times Square in New York, amid tight security, to watch the famous ball descend. On Rio de Janeiro’s Copacabana Beach, crowds will not only mark the New Year – they will also fete the 100th anniversary of Samba music, and the upcoming summer Olympics.